Neil Gaiman is a man who needs no introduction. If he did, it would be one of those three word ones like Live-Laugh-Love or Shoot-To-Kill. We all knows who he is, so it’s no surprise that Dark Horse comics is having an ongoing love affair with all things Gaiman. 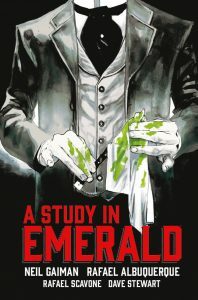 Following on the success of their comic adaption of American Gods, along with several hardcover adaptions of Bards short stories, comes A Study in Emerald. A Sherlock inspired horror mystery, A Study in Emerald follows a certain detective and his assistant as he attempts to solve a murder of Lovecraftian proportions while facing his most devious opponent yet. With art handled by the very talented Rafael Albuquerque, the newest addition to the Gaiman/Dark Horse library breathes a new life into the already award-winning work. Originally published as a short story in 2004, the new illustrated adaption once again focuses on a detective who has been entrusted with a particularly bizarre case. Written through the eyes of his assistant, we follow the pair from their first meeting as house mates to him becoming the detective’s assistant when a case falls into their laps. It seems like a nobleman from a foreign country had been murdered in a Whitechapel slum, leaving only the word “Rache” painted in his own blood. 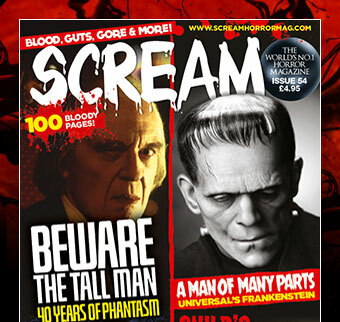 Oddly enough, it’s not the murder that that’s the strangest thing about the mystery, but the green colour of the blood, something that is only strange to the assistant. Soon, the assistant learns that there’s much more to the London underground than just thieves and murderers and that the detective knows more than he’s leading on. For long time Gaiman fans, A Study in Emerald is another “oldie but goodie” story, but for those that haven’t read the original short, it’s a fun and clever little tale that has its share of twists and shocks. It keeps the reader interested without overloading information when it came time to solve the crime or explaining the nuances of the case. The detective and the assistant are wonderful characters, both of them managing to work that old Doyle magic with their opposites attract nature. The assistant himself manages to stay a diligent observer, serving as a ‘Mary Jane’ for the reader and helps move the work along. To be honest, it’s hard to talk about the work without giving too much away, but it’s definitely one of those comics that really pays off at the end. The accompanying art is really the highlight between the short story and the comic. Albuquerque uses a soft, water colour pallet to highlight the grim and perpetually wet London underground. His thin line work almost seems to be an afterthought to the splashes of background with the characters toned and coloured in the same dreary theme. He even illustrates the vintage inspired advertisements that are placed between chapters that are modelled as a clever call back to other literary works popular during the time. Luckily, he does have the talent to pull off both comic illustration and heavy canvas colours, creating a complete work that doesn’t cut back on action or proper proportions. He really is the perfect partner to Gaiman’s words. Look out for A Study in Emerald out June 27!